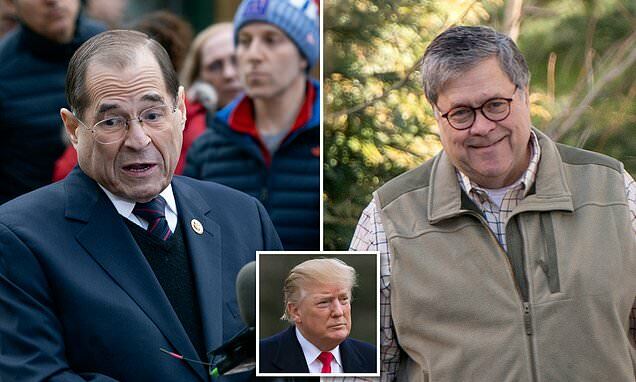 The chairman of the House Judiciary Committee said Sunday that 'yes,' he is willing to subpoena Attorney General William Barr to explain why he didn't charge President Donald Trump with obstruction of justice after he read Special Counsel Robert Mueller's long-awaited final report. Democrats have long claimed Trump obstructed justice by asking his then-FBI director, James Comey, to back off a counterintelligence investigation into Gen. Mike Flynn, who had briefly been his national security adviser before his contacts with Russia's ambassador to the U.S. put a harsh spotlight on him. They also see obstruction in Trump's decision to fire Comey later on, and his public acknowledgment that the FBI's pre-Mueller Russia probe was a principal reason. In a brief press conference, New York Democratic Rep. Jerrold Nadler demanded the release of Mueller's entire report and blasted Barr as a partisan who had his mind made up about obstruction before his Senate confirmation last month. Barr did draw that conclusion in an unsolicited memo to Deputy Attorney General Rod Rosenstein last year, long before he was considered a potential replacement for then-Attorney General Jeff Sessions. 'Mueller should not be permitted to demand that the President submit to interrogation about alleged obstruction,' he wrote then. Nadler's remarks, briefly interrupted by a heckler who called him 'a loser,' steered clear of Russia talk but suggested a new focus for Democrats now that Mueller's report has cleared Trump and his campaign of the never-substantiated allegation that they colluded with Russia to impact the 2016 election. Instead, obstruction is the new collusion.